The Palma Aquarium on the island of Mallorca, a short distance off the coast of Spain, is home to many species of marine mammals, fishes and a large variety of invertebrates. This destination hotspot is surrounded by the natural beauty of the ocean and is considered a must visit attraction when in the area. With an interest in conservation and propagation of invertebrates the Aquarist staff recently set up a coral farm to begin to house and grow corals in the back of house. With an eye towards reducing the electrical consumption and still demanding results the team selected the Orphek PR72 to light the new farm. This Pendant uses only 66-70 watts of energy yet gives a wide area of coverage and the right amount of intensity for their needs. The Orphek spectrum is designed to provide for the needs of corals without wasting light on unnecessary spectral elements. 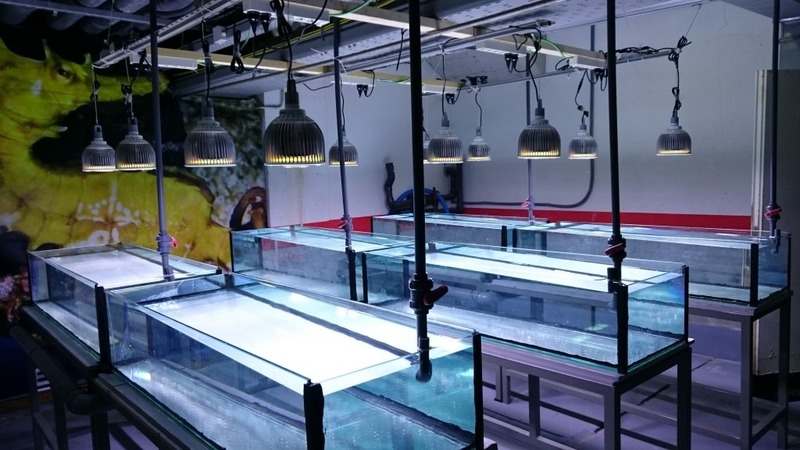 Public aquariums using Orphek products benefit from the reduced electrical costs as well as the advanced spectrum delivering growth and color in corals. Many public facilities are also using the freshwater versions of the Orphek products for planted tanks and terrestrial plants. The team plans to get the systems completed and running within the next few weeks and we look forward to seeing updates and progress on this one. We will be sure to share any updates on this program as we get them and we wish the best of luck to the team at Palma. If you are looking for the best lighting for your facility contact us at contact@orphek.com today.